Healthcare facilities, including aged care homes and child care centers, rank hygiene as one of their top priorities. This involves ensuring that germs and contaminants are not unnecessarily spread which may infect its vulnerable occupants. One of the precautions is ensuring proper standards and procedures are in place to maintain hygiene and regular cleaning, as well as educating and training staff in the implementation of these guidelines. As a specialist healthcare wipes and cloths provider to aged care, hospitals and childcare centers, TIDDOX specialises in providing such organisations with the appropriate cleaning consumables and advice to assist in upholding rigorous cleaning standards. One of its popular healthcare cleaning cloths used to wipe down equipment surfaces, particularly stainless steel equipment and instruments, and cleaning windows, glass and monitors, is the low lint INDUSTRO WIPE. These large surface area wipers (55cm x 40cm) are made from a mix of wood pulp and polyester, and tend not to leave any lint after wiping, making them ideal for polishing surfaces that require a spotless finish. The wood pulp material of this healthcare consumables cloth has high absorbing properties and they will soak up any type of liquid, solvent or chemical off any type of surface. The polyester fibers in the wipes makes them durable and ensures that they will not tear easily, even under harsh conditions, and certainly not when used in conjunction with cleaning chemicals. Suited for a number of purposes from glass surface cleaning to metal surface cleaning. The INDUSTRO WIPES are packaged in a portable cardboard box from which 300 wipers are easily dispensed. You will be well served to try out these long lasting and effective professional wipers next time you are polishing a large glass or metal surface in your healthcare facility. 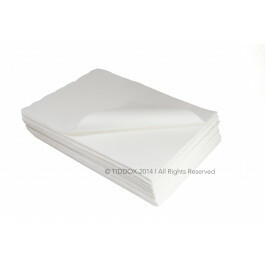 Other related products from TIDDOX 's range of healthcare cloths and wipes include the WHITE RHINO WIPES, the HEALTHCARE OMNIWIPES and the SOFT POLYSOFT WIPES.